ISIS agent Sterling Archer (codename: "Duchess") is known from Berlin to Bangkok as the world's most dangerous spy. He's a master of all the skills a top secret operative would need: martial arts, edged weapons, small arms, honey pot...ting, and scuba. And also lacrosse (he was once the most-recruited player in the country). But he doesn't do his job for justice or love of country - he just enjoys the jet-setting lifestyle it affords him! Sort of a cross between James Bond and Arrested Development, Archer was created by Adam Reed, who had previously worked on [adult swim] favorites Frisky Dingo and Sealab 2021. The show uses the same kind of purposefully retro, simplified realism art style as Reed's previous efforts, though now it's now all done on computers. Well, it's always been done on computers, but now it's done well on computers. Part of the drive for realism involves all the main characters in the show being based on real people. Archer may speak with the rich, honeyed voice of H. Jon Benjamin, he looks like former model Jason Fitzgerald. Well, the cartoon does. The toy... eh, kind of? This certainly isn't the worst likeness we've ever seen on an action figure - from some angles, it's really quite good - but the overall effect doesn't add up to something that is recognizably Sterling Archer. The jaw should be wider, the nose needs to turn up more at the end, and the face, overall, should be just a bit flatter. The time period of Archer is kind of indeterminate. He's 36 years old, but was born circa 1948. The Soviet Union still exists and Fidel Castro is the leader of Cuba, but the ISIS Agents use bitcoin and have cameras on their smartphones. 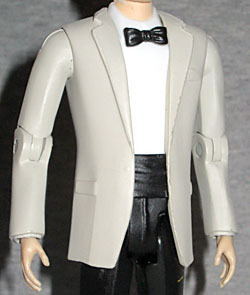 The haircuts and fashions are from the 1960s, which you would normally be able to see on Archer's suit, but this Archer isn't wearing a suit: this is an SDCC exclusive, limited to 1,500 pieces, showing Archer in his white tuxedo jacket. What a nice choice! Apparently it's getting pretty late in the evening, because Sterling has unbuttoned his jacket, revealing his cummerbund. His bowtie is a separate piece that plugs into his collar. It's a very stylish look that works for the character. The articulation is not terrific. 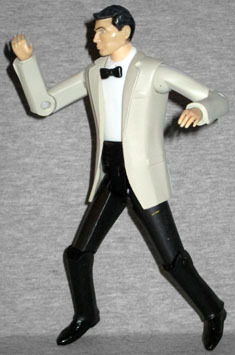 This is a 6" action figure, and yet it's barely better than Bif Bang Pow's Venture Bros. toys. He has a balljointed head, swivel/hinge shoulders, hinged elbows, swivel wrists, swivel/hinge hips, hinged knees, and balljointed(?) ankles. No waist? No torso crunch? No swivels in the thighs or biceps? That's ridiculously subpar. He can't even do karate ("the Dane Cook of martial arts") with these joints, let alone krav maga! Archer only has one loose accessory: a brown satchel. The numerous imperceptible flat planes that form its curved body just scream "this was a digital sculpt," because if it had been done by hand, it would actually be smooth. Seriously, even if you can't feel the dozens of corners, you can see them when they catch the light. 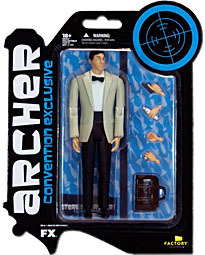 We referred to that as a "loose" accessory because Archer has three pairs of hands, half of which are molded gripping various items, and all of which are molded too small for a 6" figure. We'll get to that in moment. The hands are as follows: right hand empty, holding gun, or holding shot glass; left hand empty, shaped to hold the handle of the bag, or holding a cocktail shaker. Those are all perfect choices for Sterling Archer, and they swap out easily, but they're the wrong darn size. Hopefully the real Archer figure corrects this error, because it is blatant and it is embarrassing. It's a giant mistake, and it needs to be stopped before it goes any further. The Archer toys are being made by Factory Entertainment, a company you've never heard of unless you work there. They appear to have gotten their start doing prop replicas and such (having acquired the rather famous Master Replicas brand in 2009), but remember that NECA used to be a company that made licensed shot glasses and stuff like that. There's no shame in a humble origin. The packaging is very stylish. The left side is die cut to look like a pistol, there's a target sight on the upper right corner, and the background behind the figure is a repeating pattern of women's silhouettes, martini glasses, and liquor bottles. Overall, it's a nice mix between the show's stark, Saul Bass-inspired opening credits and the bossa nova/loungeapalooza vibe of the series. I'm kind of torn about this figure. It's not as articulated as it should be, the face sculpt needs more work, and it's been given baby-hands. 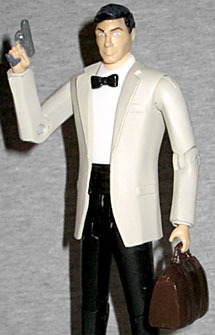 But on the other (full, adult-human-sized) hand, if you're a fan of Archer and of action figures, then all you needed to hear was "there are Archer action figures" and you started throwing dollar bills at your computer screen. So having Archer is nice, but now that I've got him in his tuxedo, I can tell the figure isn't good enough to warrant getting the standard version when it comes out. This is a good first effort, but step up your game, Factory Entertainment.